When all the children want new scooters! I’m going to slightly contradict myself here… A few years ago, I wrote a post titled, “Christmas is in December”, because I don’t like to think about Christmas until then. This year however, whilst I’m glad Christmas is still a long time away, I am starting to plan things already. Having four children, means Christmas is getting more expensive (especially when they want expensive gifts like bikes, scooters and tablets!). Last year, Christmas was paid for by a nice little article we sold to Hello magazine, about how Mike and I met. This year we don’t have the luxury of Christmas being paid for by a gossip magazine, so we need to budget in advance. Another reason we need to budget, is because my girls all want scooters. Gone are the years, when the biggest object of their desires cost £5 at the supermarket. Bunny scoots to school most days, but she has outgrown the three wheel scooter she has had for the past three years. At 10 years old, she now wants a pro scooter, with two wheels, in metallic paint, with customisable handlebars. Oh and purple… it has to be purple. EVERYTHING has to be purple at the moment. Even the twins are obsessed with purple, since I told them it was my favourite colour. They fight over who gets to eat off the purple plate. I’m tempted to hide the purple plate. Recently, following in their big sister’s footsteps, Tiny and Fluffy have been wanting to scoot to school. Past attempts at scooting to school have been disastrous, with either one twin falling off or one getting tired. Half way to school they decide they no longer want to scoot to school and I wonder whether I can reasonably hide the scooters in someone’s bush. I obviously end up carrying the scooters and the twins then complain that I’m not holding their hands. I’m pretty sure they believe that mum’s have four hands. 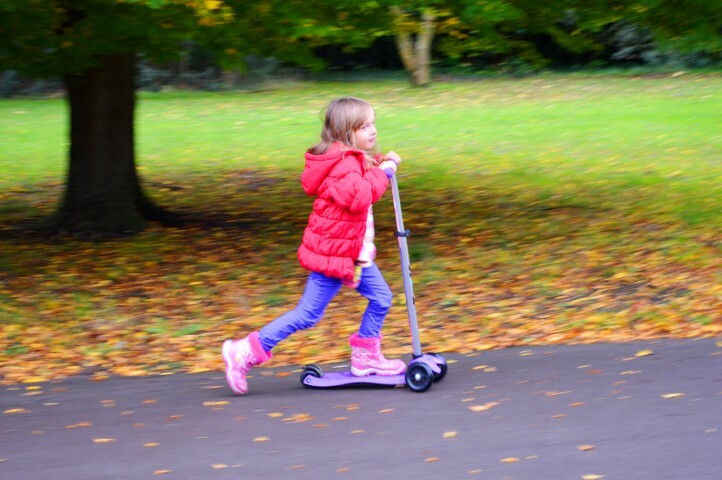 You’d think that scooting to school would be quicker than walking, but when the “scootee’s” are five years old… nope… it’s slower than walking! However, having had a few months off of scooting to school, we thought we’d give them another try. This time, the twins scooted all the way there without complaining. We did have one little fall, which caused some grumpiness but no real injury. Their scooters are getting a little too small now and the handlebars are not adjustable, so they need bigger ones. 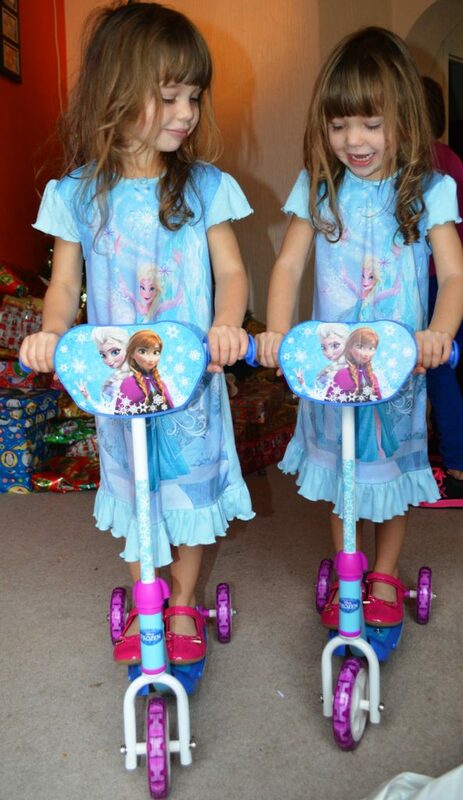 The twins when they first got their scooters. So that’s three scooters on Santa’s list so far. Baby Bear also took quite a liking to the scooters at toddler club, so I may as well seek out a toddler scooter and make it four. This entry was posted in Childhood, Parenting, Shopping, Sport, Toys and tagged Christmas, christmas wishlist, scooters, scooting to school, the school run, what the kids want. Bookmark the permalink.